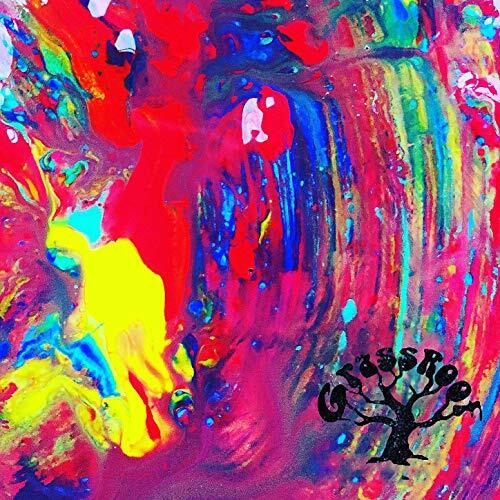 GrassRoof are Cambridge based music students, mixing their own magic formula of psychedelic-indie-pop-rock into one huge epic sound. These Cambridge Band Competition finalists have shown time and time again that they are just as electrifying on stage as they are in the studio. Their latest release Guyaka is no exception, giving us four new tracks and a fantastic live version of Microdosing Matt With Acid. This is the second EP release we’ve seen from GrassRoof in recent years, their last being Tadpole which dropped just last year. Despite the relatively soon release they have still managed to construct an equally unique and original sound as their first EP, and continue to play packed out shows around Cambridge and beyond. Guyaka eases into the GrassRoof experience with Microdosing Matt With Acid. This first track is all about atmosphere and isn’t afraid to take its time setting the tone. With deep booming drums and everything soaked in reverb, I can’t help think of a shirtless Dave Gilmore ripping a melancholy solo in a Roman amphitheatre like in Echoes with Pink Floyd. What makes this track for me is their ability to subtly control the dynamics; the electrifying vocals and heavy drum tone lead the track to psychedelic indie ecstasy, only to seamlessly return to the appropriately penned lyrical hook of the first section of the song, “I’m excited”. Needless to say me, and my neighbours, have been listening to this track on repeat. The second track Tadpole takes less time to introduce itself. A few bars of choppy guitar and a few bars of hi-hat and then you’re thrown in the deep end. This track is a free for all blend of 80s disco synth, funky fresh bass and a vast, effortless guitar section all held together by a rock-solid drummer. This track to me, is quintessential GrassRoof, taking us to the psychedelic stoner disco and throwing the doors wide open. Spiral Anna takes us on a slightly different journey. It kicks off with a dreamy shoegaze-esque guitar riff, slowly acquainting us with the feel of the track. The drums accompany with some light cymbal ornamentation and then the bass comes into accent the first two notes of the bar giving some depth and a punchy rhythm to the floaty overlapping melodies. What stood out to me in the first section of this track is the unique style in the tone of vocalist James Turnbull; the lyrics and pitch are so reminiscent of 80s prog that Geddy Lee might have well of written the parts himself. It then kicks off into a heaving rocking jam, interluded with an uber tight acid rock solo from drummer Ben Parker, and screeching psychedelic guitar distortion lathered all over it. Tasty. The last track on this ep is BLine. A solid, slow polyrhythm from parker sets the pace, being joined shortly after with a funky 80s arpeggio synth from keys section Rayne brown. This band have a remarkable ability to flow from one epic section to another in a perfect hivemind unison, rising and falling between floaty funky acid riffs. This track captures the essence of so many legends in music history, and perhaps wouldn’t have been out of place on my dad’s record player 20 years before now, but the magic GrassRoof formula stands on the shoulders of giants to bring a cutting edge new sound to the Cambridge scene. This is not an EP you can afford to miss.